Dot matrix printers are generally used for printing special forms and long lists (such as accounting reports). They are notable for their low printing cost and long service life. The printing method resembles a typewriter—pins strike an ink-soaked ribbon against the paper. This creates text or simple graphics elements consisting of dots. What should you focus on when choosing a dot matrix printer? Print format - the most common formats are A4 and A3. Printing uses special tabulating paper. Number of pins - usually you can find printers with 9 or 24 pins. Printers with increased pin-count are faster, have better printing quality, and are usually quieter. 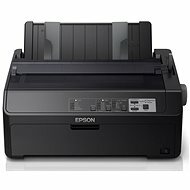 9-pin printers are suitable for simple data logging, but for documents that require higher print quality you need a 24-pin printer. Print speed - determined by the number of characters a machine can print per second. Ranges between 300 and 1550. Carbon copy - the option to create an exact copy of the printed document on carbon paper. The number of carbon copies can range between 3 and 9. Connectors - USB for universal connectivity with all modern computers. LPT (parallel port) if you need to connect legacy systems. 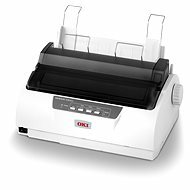 Dot matrix printers are the oldest type of printers, however, are still popular for their reliability and low cost operation. 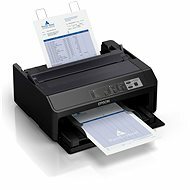 This makes the dot-matrix printers ideal for use in a commercial environment, specifically as POS printer in stores, restaurants, or over the counter shops and accounting departments. Dot matrix printers operate on the principle of using press needles, as a rule, 8, 9 or 24 needles are used. These are placed in the print head and transfer small dots on the paper from which the printed text or image is composed. The advantage is that you can print several copies at the same time (using a copy paper). In addition, the ink ribbon gradually becomes more and more useful in a single-needle printing process. You will notice this in time, if it has to be replaced. Dot matrix printers print on paper with side perforation, which guarantees very good guidance of the paper and thus accurate printing. 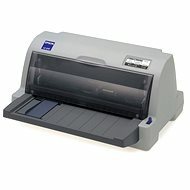 For the connection of other devices, Dot matrix printers usually use connector types. i.e. LPT, USB, NET, the first two being the most widespread. Within the scope of the accessories you can buy ink ribbons for a dot-matrix printer. 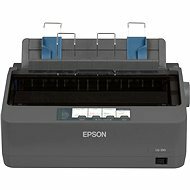 High-quality dot matrix printers of all price levels can be bought from companies such as Epson and OKI.